Put it on a Post-It! One way I keep everything organized is by using colorful post-Its. For work, home or play – color-coded post-its can help you keep track of anything! There are many different ways to use these bright note keepers, but like any good organizational system, it has to work for the person that is trying to stay organized. 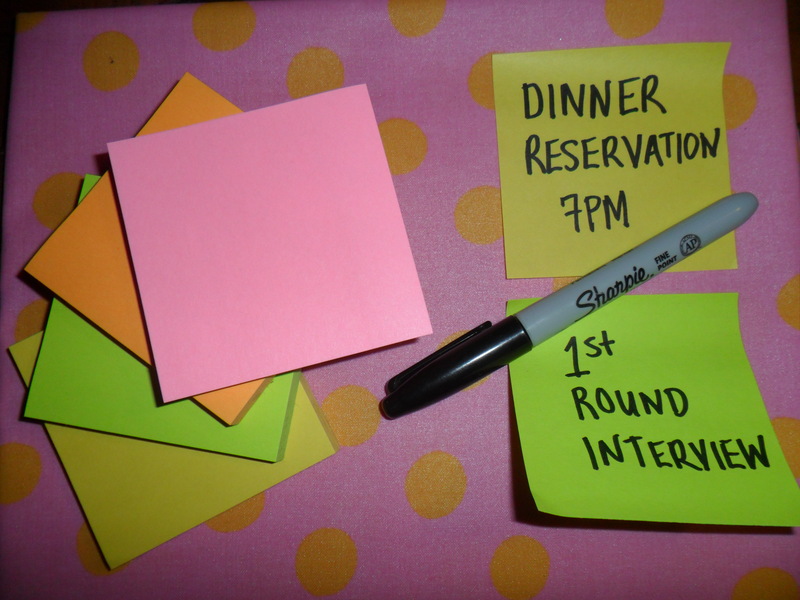 Here are some ways to use color-coded post-its. Maybe there is a system here that will work for you, or can be adapted to suit your needs. 1. In your calendar, colors can represent different types of appointments: personal, work, errands, holidays. 2. On a family bulletin board, every family member can have a different color. Pink post-its can be for your daughter, orange for your husband, yellow for your son, and green for your pet! 3. At work when reviewing resumes, you can use different colors to categorize where the candidates stand in the interview process: reviewing, 1st round interview, 2nd round interview, in consideration. 4. When working on a project colorful post-its can help you organize your thoughts and inspirations. When decorating a room, put all your thoughts on post-its. Furniture ideas on one color, lighting on another color, wall art on another. Put the post-its right on the wall – you are probably painting the room anyway! Add swatches and pictures too. 5. Post-its can help organize paperwork. Put all important paperwork in folders or envelopes and label with color post-its. Blue for health insurance, green for home, orange for car, yellow for school. These are just some ways to use color-coded post-its – I am sure there are millions more! Do you use post-its for anything? What are some of your tricks and techniques when using color-coded post-its? I would love to hear them. Leave a comment and tell me how post-its fit into your life! I love the idea of color-coded post-its! Thanks for the tip! When I was teaching English, I had students use post-its to add revisions to their drafts. It was a lot less intimidating to write a bunch of notes on post-its and place it on their current draft than feeling like they were starting the paper all over again. That’s a great idea. I also used post-its when I was a teacher! Thanks for reading! I use post it notes to quickly jot down milestones in my girls’ lives- first tooth, new word, things like that- then I stick the post it on that child’s baby book. Later, when I have more time and a nice pen, I’ll use the post its rather than relying on memory and keep up with the book! Great blog, maureen. Thanks for sharing! That is such a great idea – I’m going to use that!